Home again after our wonderful camping adventure and here is the first of my retrospective reports. Internet coverage is only available in the vicinity of a few towns in the western part of Qld. and I didn’t feel like spending much time in front of a computer when there was so much to see so that is my valid excuse for an absence from blogging. 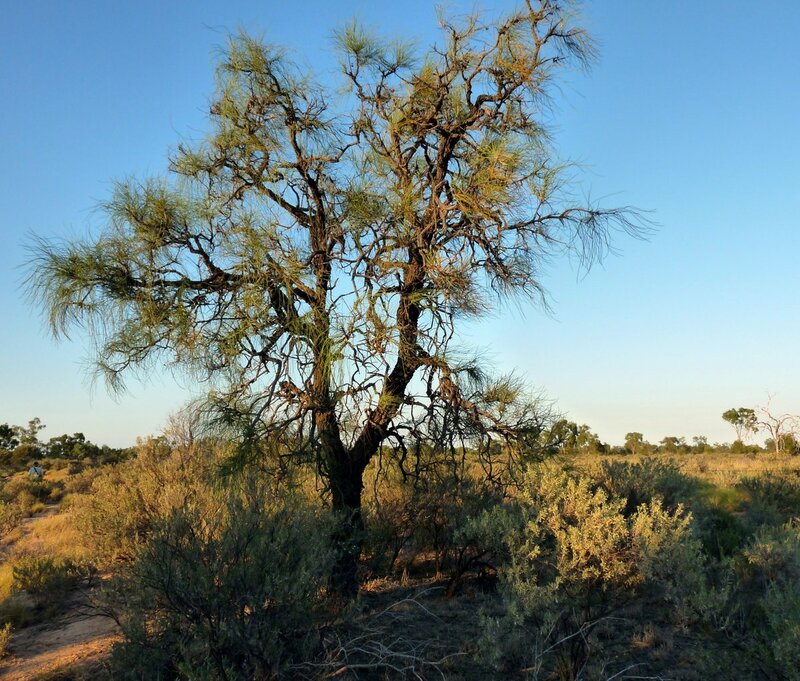 Bladensburg is about 80 km SW of Winton – it was lovely to be in a quiet spot, camped on the edge of a waterhole in the shade of some Eucalypts after the crowded campground in Longreach. We had a view towards a large area of Spinifex through which a Bustard was walking when we arrived, a rather nice welcome we thought. Large numbers of macropods were present, the majority appearing to be Wallaroos, particularly evident at night when they were busy feeding on the grassy areas amongst the spinifex. Our bird highlights here were Crimson Chats and White-winged Fairy-wrens but the Rufous-crowned Emu-wren remained elusive in spite of various excursions to suitable habitat. The flowering plants were lovely but trying to identify them from the books we carried with us was often quite a challenge. Sometimes we just enjoyed them, whatever they were called! This Sandalwood was growing on the river bank just along from our camp. 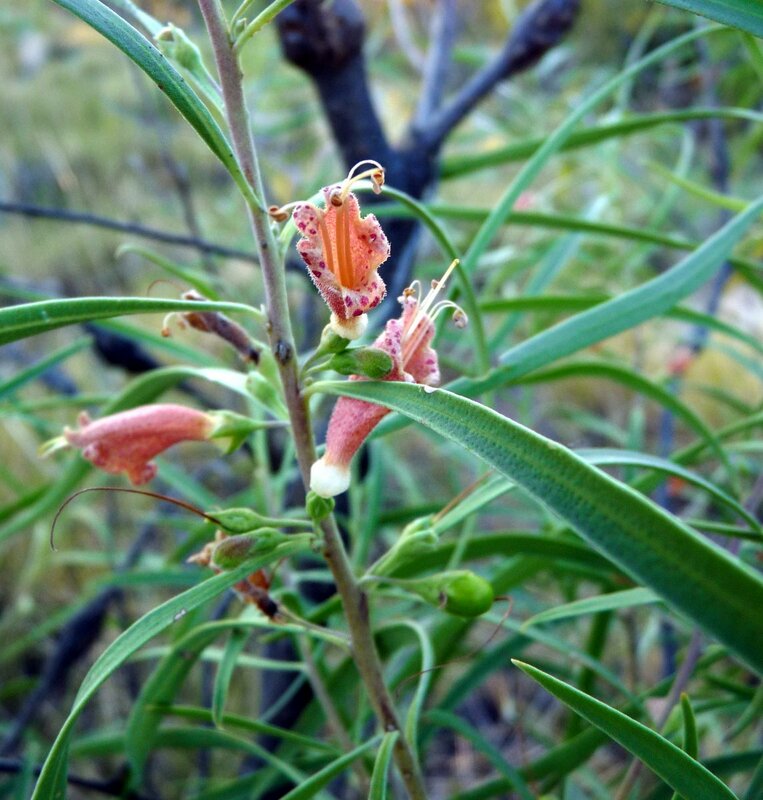 From the camp-site we drove to Skull Hole and clambered down to the creek bed where we found quite a variety of plants in a somewhat sheltered situation subject to seasonal inundation. 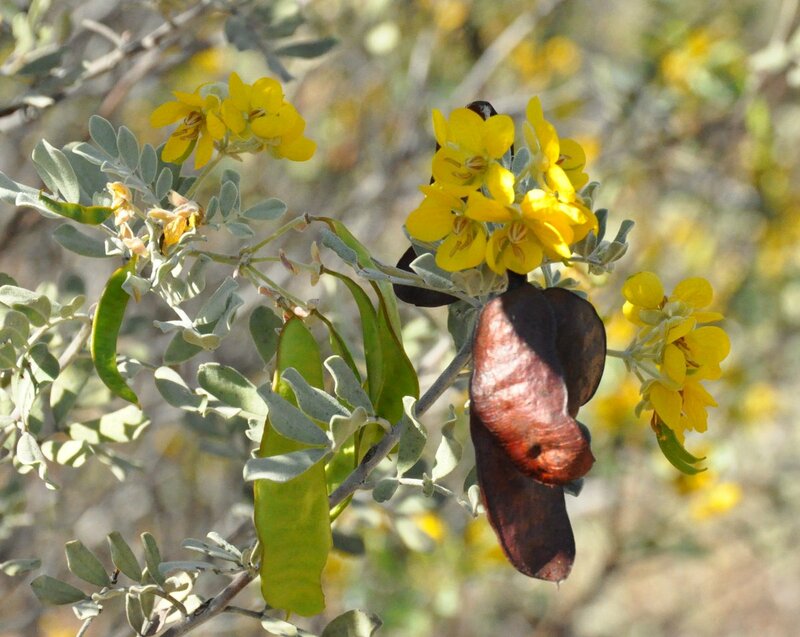 There are a number of subspecies of Senna artemisioides and I am not certain enough of our identification to name them. And we kept finding more and more Eremophilas which provided a lovely variety of colour and form. like the form of this Pincushion Spinifex (Triodia molesta). The swept back look of the seed heads gives the clump a sense of movement – as if any moment it will take off again or perhaps my imagination has been let loose! 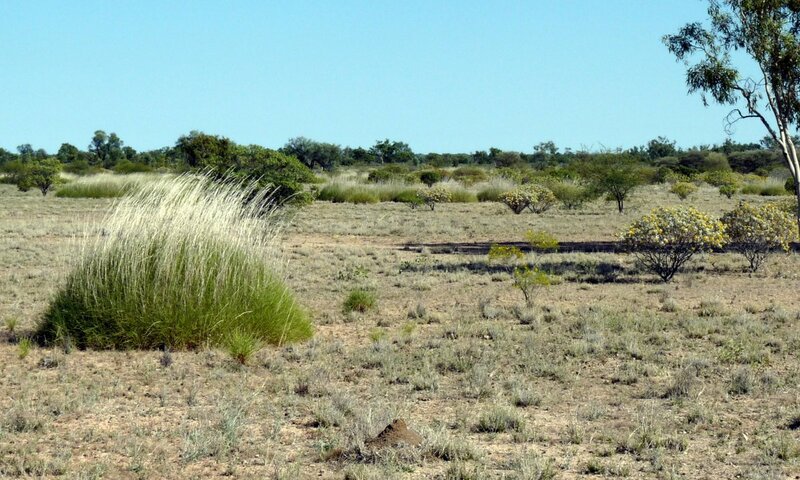 And while walking through the Spinifex in the early morning, enjoying the warmth of the sun, it is wise to keep a look out for other creatures looking for warmth and food. 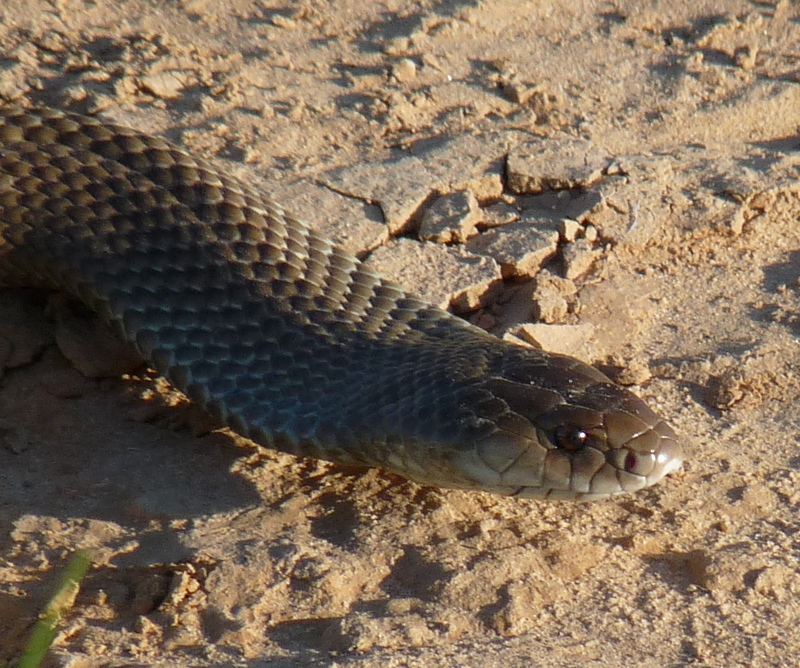 We treated this Mulga snake with the greatest respect (after annoying it slightly trying to get a good angle for a photo or two) and it was more than happy to disappear into a nearby clump of Spinifex. Senna notabilis, another one of the many Sennas in flower, has the very appropriate common name of Cockroach Bush. Being so used to tall trees in our home environment I found the vast areas of grasses and shrubs to be an interesting contrast. It is difficult to capture the feeling of vast distance in a photo and so often I decided to enjoy the moment and forget the photo. However, this lovely specimen caught my eye with its pleasing shape – Bootlace Hakea (Hakea chordophylla) which we found flowering later in the trip. 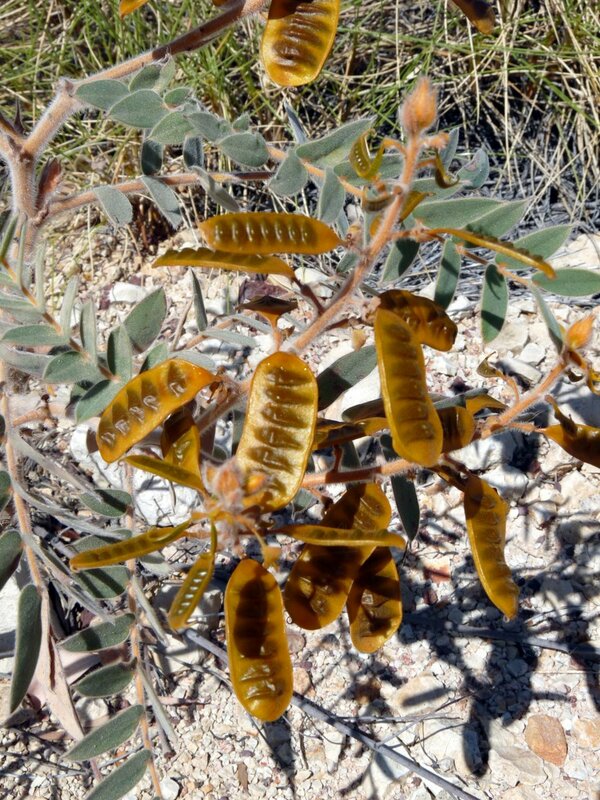 This entry was posted in Excursions and tagged Bladensburg National Park, Eremophila, Mulga Snake, Sandalwood, Senna. Bookmark the permalink.